Since 1997 the Washington Redskins have played at FedEx Field in Landover, MD. Prior to 1997 the team spent over three decades at RFK Stadium. Many fans, including Redskins owner Dan Snyder, can recall many great memories and teams that played at RFK Stadium as it was a small intimate stadium where the fans were close to the action. FedEx is a massive stadium that seats nearly 90,000 fans and is not situated in an ideal location. 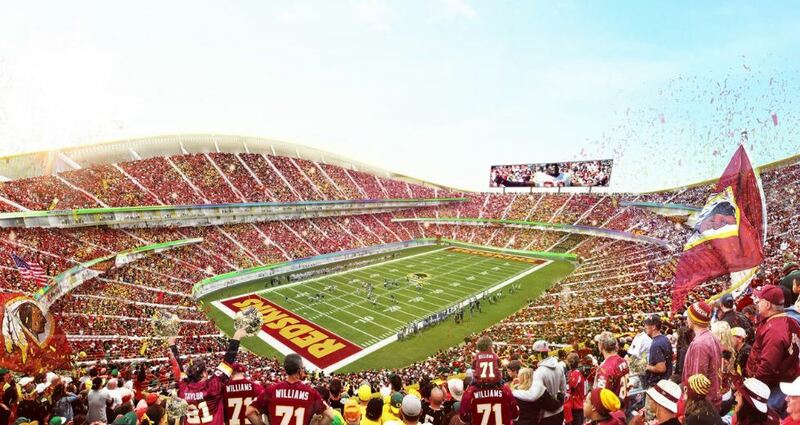 In March 2016 the Redskins unveiled renderings of a new stadium concept that could be built in the Washington, DC metro area. This concept features a circular stadium with a seating capacity of 60,000 with every seat in a massive bowl where all fans can easily see and cheer on the Redskins. It also features several other concepts including an exterior wrapped in a golden metal mesh that curves back and forth, a moat surrounding the stadium allowing for water activities, parking for 25,000 cars, a Redskins museum and facilities for the Redskins headquarters and training camps. No site or potential opening date has been determined.